Note 2014/01/16: Still works with 1.66. Note 2013/10/18: Still works with 1.63. Note 2013/09/04: Still works with 1.57. Note 2013/06/19: Still works with 1.55. Note 2013/02/20: Still works with 1.50. Note 2013/01/22: Still works with 1.48. Note 2013/01/09: Still works with 1.47. Note 2012/10/31: Still works with 1.42. Note 2012/09/27: Still works with 1.39. 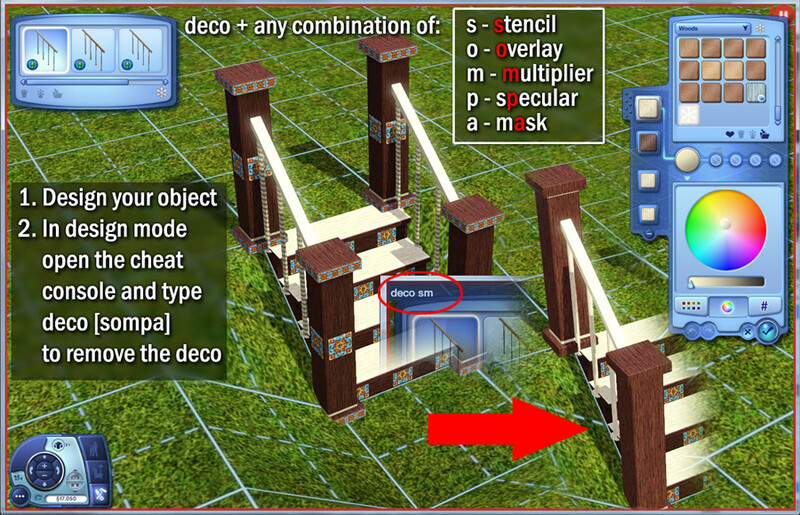 Updated 2012/06/17 to v1.1: Added more finely tuned options when removing decoration and remove on all objects on lot interaction. If you're like me, you've often wished for a way to get rid of the flowers on the Country Fried Counter or on the Four Post Bed, the giant red/pink cupcakes on the toy oven, or a stencil on a shirt. 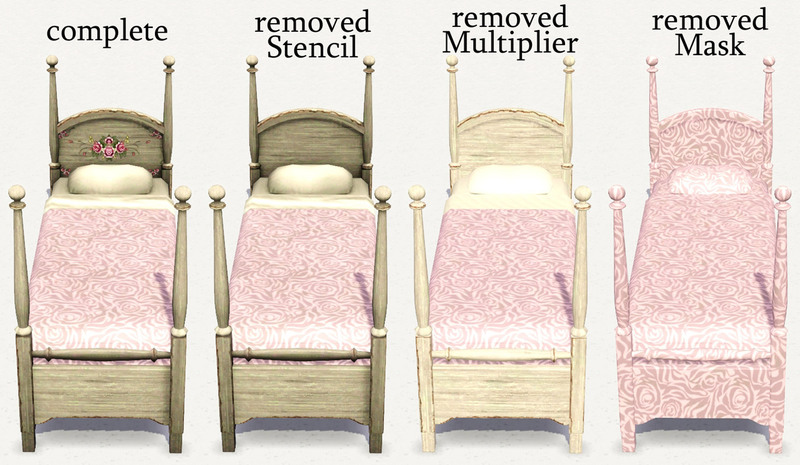 This mod allows you to remove stencils, overlays, specular, multiplier, and mask while you are playing. It comes in two flavors, one as an interaction, the other as a cheat, and works on CAStable objects. The two versions are completely independent from each other (even though they do the same thing), so you can use either one of them or both. 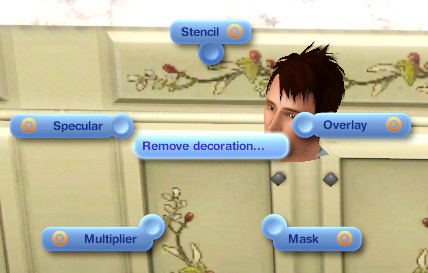 If an object has different decorations in different presets, the decoration is a stencil. If image-like decorations are not a stencil, they are likely an overlay. Speculars are responsible for the shininess of the object. Multipliers are responsible for the shadows, which create "depth" on the object. Removing the mask will leave your object with a single channel. This will not affect the presets or other objects of the same type, though you can store the stencilless look of your object as a new preset. 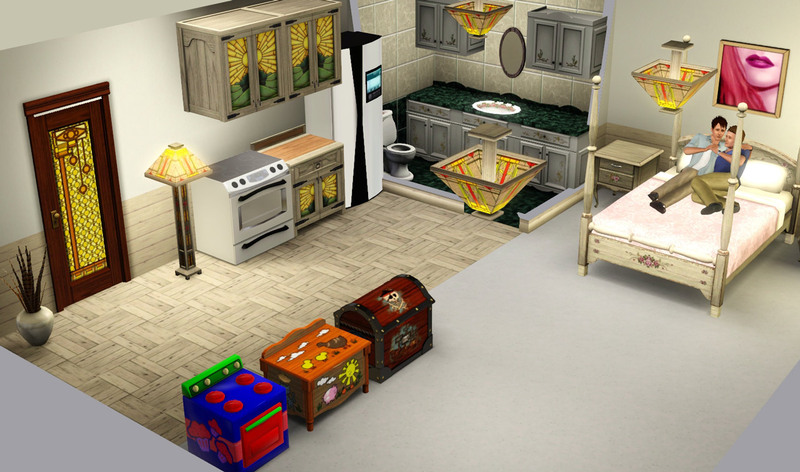 You can at any time use one of the presets to get the decoration back. Tip by Srikandi: To get the deco changes to stick, remove the deco, then close the CASt dialog (confirming the changes), and then go back into CASt. 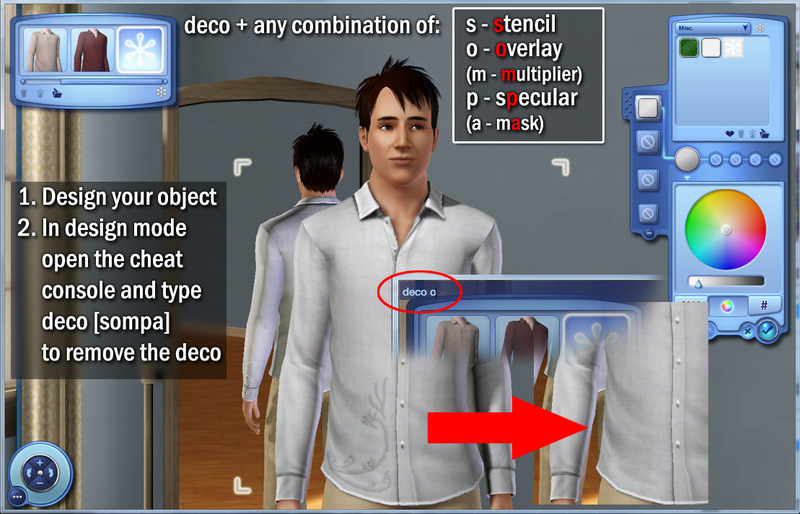 Now the deco changes stick even after changing patterns and when saving presets. CAS parts sometimes revert the deco changes when making further modifications (either CASt or more deco changes). If this happens simply reapply the change or apply multiple changes at once or confirm the CASt dialog and re-enter CASt after applying the deco change. 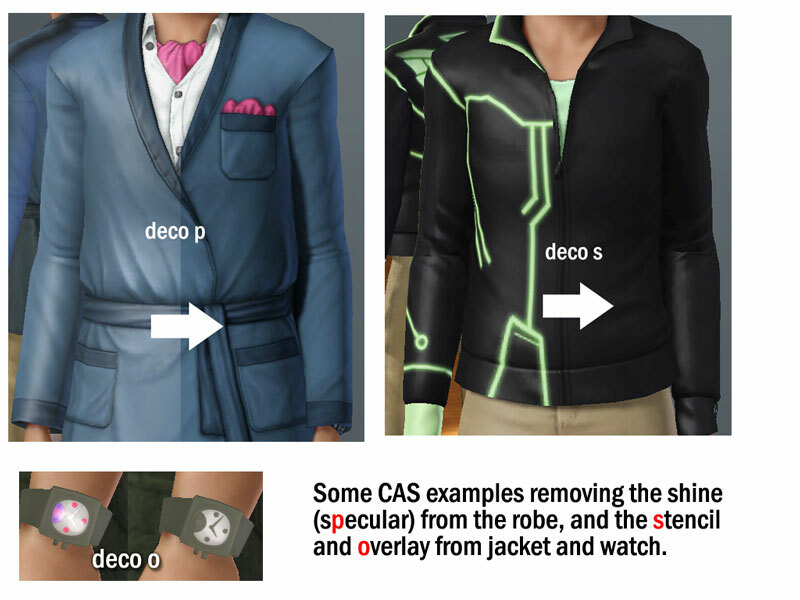 Removing the multiplier and mask is not recommendable on most CAS parts since removing them on a top or bottom will affect the hands and the skin of the Sim will be replaced with one of the patterns. However, the option might be useful on some accessories. The eyedropper works in general to clone an object with removed deco. However, counters are changed when they are placed next to each other and this also resets the deco removal. Place them first and then remove the deco on each one. The same applies to other modular objects like the swing set. Undo should work on deco changes more or less like expected (I did notice some weirdness on stairs, which seems to be unrelated to this mod). However, when doing a deco change in CASt without first doing other CASt changes, undo will not restore the deco. In that case simply cancel CASt to go back to the previous design of the item. Overriding the overlay does so completely. E.g. when you do it on the toy oven, you not only get rid of the cupcake decor on the side, but also the details on the top and back. 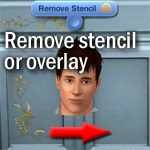 If you need to remove only parts of a stencil/overlay, you cannot achieve this with this mod. You can see some general examples in the before/after pics below. This mod cannot control how good an object will look when its decoration is removed. This depends entirely on how the object is built. 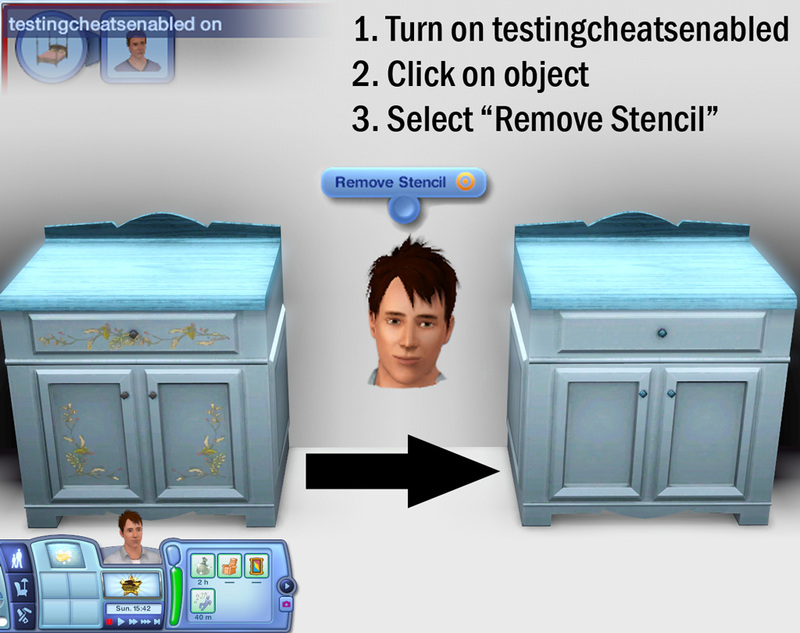 This version of the mod adds interactions called "Remove decoration..." to recolorable build/buy objects in Live mode when testingcheatsenabled is on. Additionally, when clicking on terrain, an option to remove from all objects on the lot is added. Note: Since the cheat version of the mod works on more objects and interferes less with gameplay, that is the version I intend to maintain (if necessary). I'm leaving the old version up in case some people prefer it despite its limitations. Note: Options will only appear if they haven't been applied yet and can be applied. The interaction will not appear on uncolorable objects, stairs, railings, fences, or counters in corners (and possibly other things). 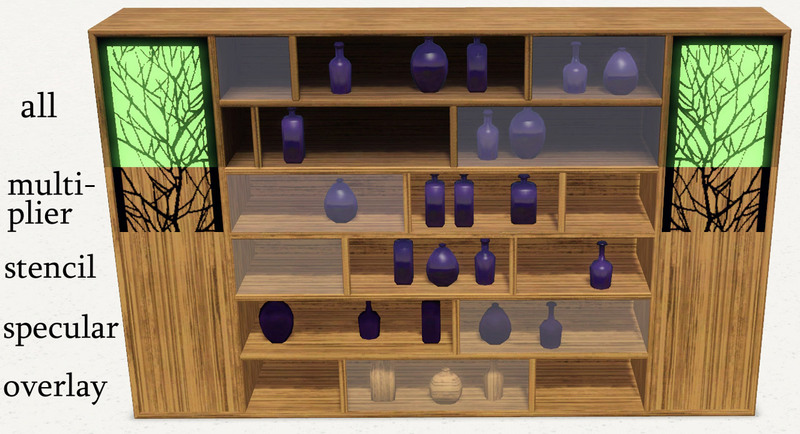 For island counters the interaction will not appear after placing the object and returning to live mode, but it will appear after loading a save game. Please make sure that you really want to change all objects on the lot when choosing that particular interaction since it can only be undone manually. E.g. remember that windows etc. will also be changed, so you might have to manually go back to a preset for them if they suddenly turned to wood (and this was not what you intended). Testing: I tested creating a preset, lot, and household with lot, sharing it, and loading it in a different Any Game Starter Profile game which did not have the mod and had no apparent problems. I haven't tested this on CC, but it should work on that too. ETA: It has been reported that it works on CC too. Conclusion for builders: As far as I can see this should be safe for you to use in lots, and users who download the lot do not need to install the mod to see the object without stencil/overlay. However, I only did a few tests, so I'd welcome confirmation that this does indeed work as expected for yourself and for others (without the mod) when shared. ETA: So far no issues have been reported. This is a scripting mod and unlikely to conflict with other mods. While it was created for and tested with patch 1.34, it could also work for older versions. Inge and Peter Jones for S3PE, jonha for Any Game Starter, armiel for Builder's Island - DIY, and Twallan.